Scitec Amino Liquid 50 - is a blend of essential amino acids, which support maximum muscle growth and maintenance of muscle tissue during dieting or extremely long training sessions. Scitec Amino Liquid 50 is manufactured with the highest quality protein to ensure optimal results. There is a great amino-day, by being subjected to hydrolysis were divided into groups so that the peptide show a strong anabolic effect. Each serving provides a huge portion of the amino acids, which must never be lacking in the diet of any athlete. 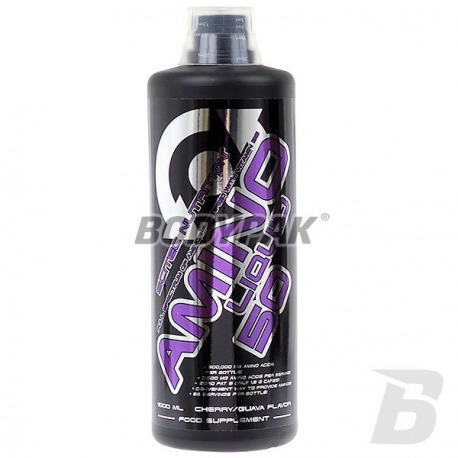 Due to the specific way Amino Liquid absorption into the blood stream 50, the supplement works best when used on an empty stomach and without food. Amino acids are extremely important part of the diet - provide the energy needed for proper muscle, are the building blocks from which are built muscles, reduce catabolism, or muscle breakdown during exercise, hunger and stress. Consume one serving 30 minutes before each meal. Pierwszy raz sięgnąłem po tego typu produkt i odczułem różnice w regeneracji. Przekonałem się na własnej skórze, jak bardzo ważne są aminokwasy w naszej diecie!